If you're a full-time working gal (or guy) like myself, then you most likely know what it's like to sit at a desk all day. Even though I love my job and the days fly by, you still want your desk/cubicle/office to be comfortable, fun and show off some of your personality. I love bringing in a few things to spice up my work space and make me more productive. If you're on the hunt for some fun items keep reading how to make your work space go from drab to fab with just a few key pieces. Calendars // Calendars are a great way and honestly a must-have accessory in a work space. You can obviously have any type of calendar or agenda that you'd like, but I personally love my little easel calendar from Shutterfly. It's personalized, unique and still professional. Pictures // You can always make your office a bit more personal with some pictures and unique picture frames. I feel like this is an easy one, but everyone's office is a little different. Some of my favorite frames include this one, this one, and this one. You can also do prints like this one, this one, and this one. Candles, Wax Warmers and Oil Diffusers // Again, this all depends on your office, but having something that smells good is a great way to make your office or cubicle welcoming. Pin Boards & White Boards // These items are great for anyone who needs to write a quick message to themselves! These have become so stylish in the past few years, you can always find a unique one versus the classic brown and white ones. Notepads // This sort of goes with the whole pin and white boards, they're a classic thing to have on your desk, but they've gotten so trendy the past few years that no two look the same. My favorites include this one, this one and this one. Desk Chairs // This is something that if you can and have the money for, then you should definitely invest in one. I sit at my desk all day and I want to make sure I'm comfortable. You can even get some chair accessories such as a back massager, a throw blanket or a pillow. 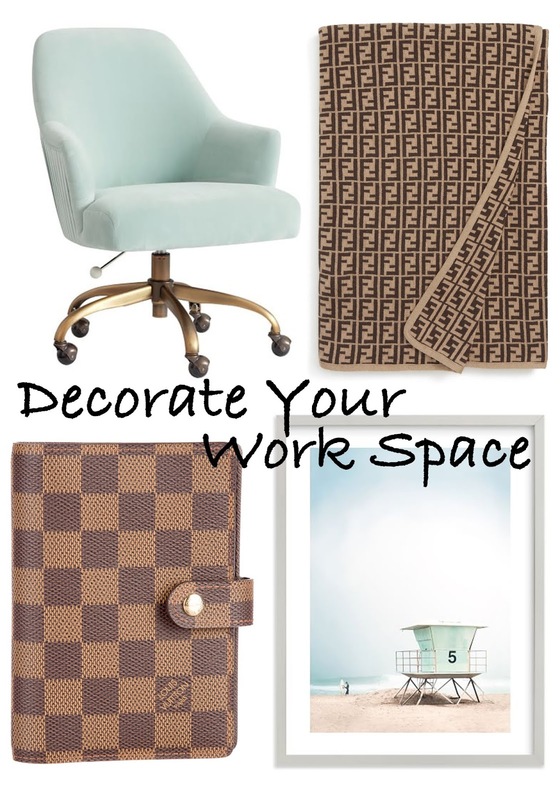 These are just a few items that you can use to spruce up your office space! If you have any more recommendations please let me know by commenting down below!